No doubt you have seen Massana Construction crews hard at work under the Aurora Bridge. WSDOT thought it was time for a project update to let you know what’s going on and how long it will be happening. 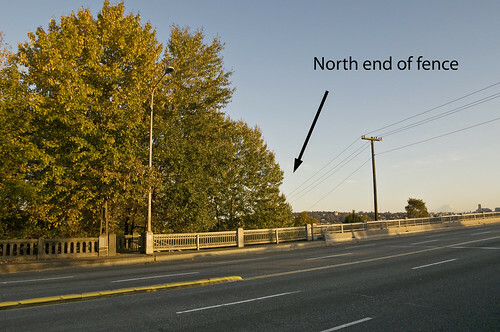 To refresh your memory, contractor crews are working on phase three of a three-phase plan to retrofit the Aurora Avenue bridge to make it better withstand earthquakes. This current phase wraps support columns with FRP (fiber reinforced polymer), a specialized wrap that conforms to the unique cruciform (“+”-shaped) style for the columns that support the bridge. In short, it allows Fremont to keep the look and feel of the historical period while satisfying the safety and earthquake needs that come with a modern structure. If you are in the area, take a look at the column across from the Troll on 36th Street on the southwest corner. Crews just did a test section to see how it looks. It appears to have worked well. Now crews will wrap the other 14 columns on the north end and four columns on the south end with this specialized wrap. We will be on this end of the bridge into early next year. However…..we will suspend work and move our equipment for the Troll’s birthday on Halloween. We hear a lot of you Fremont folks like to help the Troll celebrate in costume. 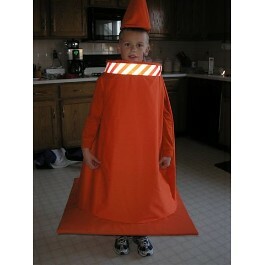 Maybe we’ll join you, dressed as a safety cone! Sunday night, traffic came to a standstill when a woman threatened to jump off the Aurora Bridge. Thankfully, after the arrival of police and ambulances, she decided to come down. According to Christopher Reaves, who live-tweeted the saga, police had to cut away part of the recently-upgraded fence along the bridge to get her. More details to come, I’m sure. Just glad to hear she is safe and they were able to convince her to come down. According to Seattle Friends, over 230 people have committed suicide from the Aurora Bridge. I know you always drive safely on Aurora Avenue. You always stay focused, drive calmly, don’t chat on your cell phone while driving and certainly avoid drinking and driving. We’re on the same page with all of that. I just want to make sure you know to REALLY do all of those things (or not do those things, as the case may be) on Thursday. The Aurora Traffic Safety Project will be performing a “safe driving enforcement patrol” on Aurora Avenue North all day. For more information about the Aurora Traffic Safety Project visit www.seattle.gov/aurora. You know that bridge above from the way it is on the left. There was a time not too long ago, however, when it looked a lot more like the image on the right. 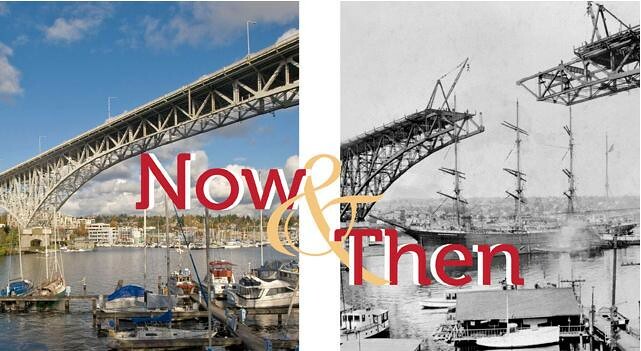 If you’re a regular reader of Seattle Times Sunday magazine, you’re used to seeing Paul Dorpat’s popular ‘Now And Then’ column, featuring the contrasting images of old and new Seattle like this one. This past weekend, the Museum of History and Industry unveiled a “Now and Then” exhibit, styled after Dorpat’s column. The exhibit include the work of Jean Sherrard and Berangere Lomont and features photos of four locales: Seattle, Washington State, the Wallingford neighborhood and Paris. The exhibit runs through June 3, 2012. Now and Then tours at the University of Washington are scheduled for April 17, May 15 and May 18. Check the MOHAI calendar for more information. If you sat in it all morning, you already know, but there were two crashes on the Aurora Bridge around 9 a.m. that closed five of the six lanes for a good while. No word on injuries but all lanes have since been cleared and the cars have been cleared off the road. Here’s a photo of one of the crashes via MyWallingford. 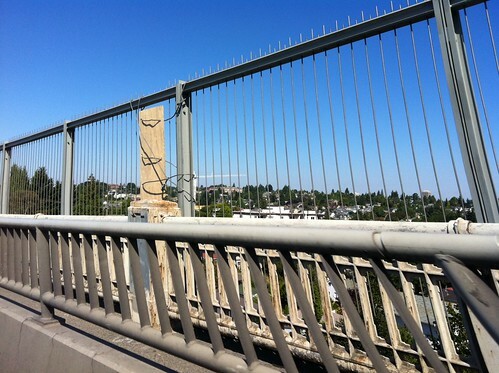 Work to build a suicide prevention fence across the Aurora Bridge has been underway for months, but there’s still no sign of the fence itself. WSDOT tells us that will all change next week when crews start putting up the fence posts on the west side of the bridge. Just when you thought WSDOT was finally done with its work on the Aurora Bridge, it turns out crews found more rivets to remove. Crews found the rivets when they began repairing corroded steel portions of the bridge at 23 fence post locations. It means more lane closures and planning for traffic delays if you’re using the bridge this weekend. On Saturday, Sept.25, two out of the three northbound lanes will be closed from 5:30 a.m. until 1:30 p.m.
On Sunday, Sept. 26, two out of three northbound lanes will be closed from 5:30 a.m. to 4 p.m. and again from 6 p.m. until midnight. Seahawks fans, WSDOT is giving you that window of opportunity to use all the lanes from 4 p.m. to 6 p.m. to accommodate post game traffic. There are a total of 186 additional rivets that must be removed as part of the steel repair work. The rivets are located under the bridge in tight areas where access is difficult, requiring at least two more weekends to bust them out. WSDOT can provide you with industrial strength earplugs if all this racket is causing too many sleepless nights. Call its 24-hour noise hotline, 206-440-4099, for more information. 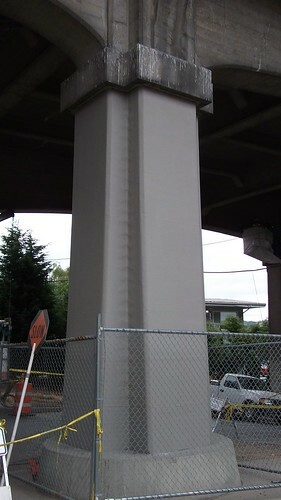 The work is part of a WSDOT project to install an anti-suicide fence on the outer railing of the bridge. Work began in May. Unfortunately, there was a recent suicide from the bridge on Sept. 11. One of our readers, Ryan Healy, who lives on 34th across the street from the Lake Washington Rowing Club, and has a view directly of the bridge and water beneath it, e-mailed us to let us know. This is the second suicide I’ve seen in the past 5 months. Seattle Police confirmed there was a successful suicide from the bridge that day at about the same time as our reader mentioned, about 1:15 p.m.